I’m writing this brief post onboard the Eurostar to Lille. 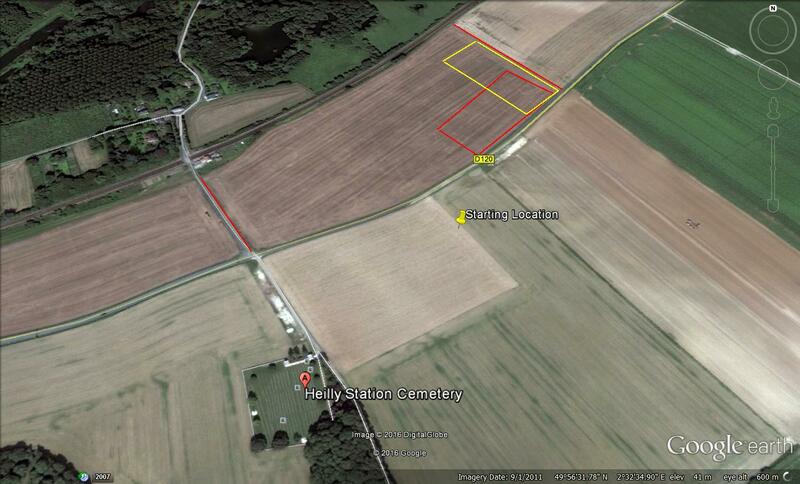 Tomorrow I’ll be touring parts of the Somme battlefield for the first time. The primary reason for my trip is to visit the the grave of my great-great-uncle, Frederick John Holbrook, at Heilly Station Cemetery. That brings me to the coincidence. Earlier in the week a friend was making her own centenary trip, it was only when she posted photos on Facebook that we came to a surprising realisation, initially I just thought she’d remembered Fred’s name after I’d mentioned it in passing sometime, and had decided to take a photo for me. It soon became clear though that she was actually interested in the second (of three) name on the headstone, C A S Pratt was her great-grandfather. For a century our relatives have been lying in the same grave (Photo), while we’ve known each other nearly 20 years. It would now be interesting to make contact with relatives of the third man Harry Morland Atkinson (spelled Harry Mauland Atkinson in some sources). The trip will be taking in a variety of other parts of the area, starting with Thiepval, and covering the area between Mametz and Bazentin-le-Petit woods where Fred was probably wounded, and the Welsh Memorial at Mametz too. I’ll pay my respects to a few of the Surrey (and other) ringers too on the way round. Hopefully I’ll be able to make more posts during the trip, time and web connection permitting. I may tweet a little too. This entry was posted in family history and tagged Charles Albert Samuel Pratt, Frederick John Holbrook, Harry Mauland Atkinson, Harry Morland Atkinson on 22/07/2016 by davidunderdown95. This entry was posted in Off-topic and tagged First World War, Frederick John Holbrook, Welsh Regiment on 18/01/2013 by davidunderdown95.